Who really cares that Sen. Toni Atkins became the first woman and first LGBT person to lead the California Senate on Wednesday? Shouldn’t we be more interested in her character and ability to lead? James Bartholomew identified and coined the phrase “virtue signaling” in a 2015 Spectator article: “Saying the right things violently on Twitter is much easier than real kindness.” But what is Virtue Signaling? It is when people take a conspicuous but essentially useless action ostensibly to support a good cause but actually to show off how much more moral you are than everybody else. And leftists and frauds use virtue signaling to cover for their corruption so they can’t be called out on it. The last California Senate President was a Latino male. Who cares? Before him was a white male. Both were lousy leaders plagued with scandals. “Sen. Holly Mitchell, a Los Angeles Democrat who is black, said the portraits of past presidents pro tem all look remarkably familiar; before de Leon, who is Latino, they were all white men,” KPBS reported. What a load of drivel. Many of those white men cared about the future of California and governed accordingly. And some of them were atrocious. The fascinating thing about watching these political and media ignoramuses virtue signal to each other is they are signaling only to each other. Most Californians don’t give a rip. With their narcissism on full display, California’s Democrat politicians have forgotten they represent the masses and are supposed to care about popular opinion. Sen. Toni Atkins (D-San Diego) replaces Los Angeles Democrat Kevin de Leon, who is departing as Senate Pres. pro Tem under term limits, and is running for U.S. Senate against current U.S. Sen. Diane Feinstein. What the hell is the relevance of a female LGBT Senate leader? Most interested California residents want to know what she’s going to do about the state’s impending pension tsunami, and wall of debt. Or California’s crumbling infrastructure? Or if she plans to build reservoirs for water runoff storage. Most people don’t really care about who she sleeps with or why. Disabled persons in California rank higher in population at 6.8%, than gays do at 4.6%. Where are the all of the disabled lawmakers, if the left is so interested in truly representing all of the people – or are they really only interested in identity politics and virtue signaling? 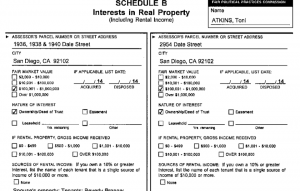 Toni Atkins was a San Diego City Council member from 2000 to 2008, and served as acting mayor for several months during the pension crisis that erupted in 2005, the San Diego Union Tribune reported in December when Atkins was chosen by the Senate to replace de Leon. What we should be concerned about is that Atkins is the new Senate President. She’s a leftist and proudly represents the tiny minority LGBT community. She authored a bill to make gender a personal choice. Her bill, signed by Gov. Jerry Brown, streamlined the process for people wanting to change their gender to “non-binary” on official government documents, such as driver’s licenses and birth certificates. 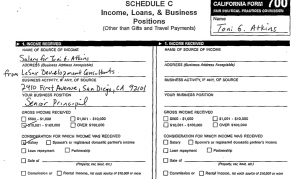 Atkins has some serious conflict-of-interest issues as well. 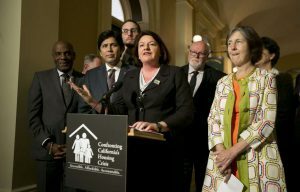 In 2015, then-“Assembly Speaker Toni Atkins, a lesbian whose wife, Jennifer LeSar, heads LeSar Development Consultants, which specializes in affordable housing, has been accused of conflict of interest for her proposal that California hand out $500 million for apartments for low-income residents,” Breitbart and the Los Angeles Times reported. 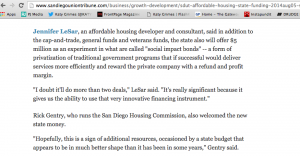 San Diego watchers have revealed that Atkins’ wife LeSar underwrites these affordable housing loans. “She just pulled that from her website but it was there,” one person revealed. “She helps clients get these tax dollars from the successor agencies and then she underwrites the loans. And she IS a developer. She develops via a company called Bridge housing. 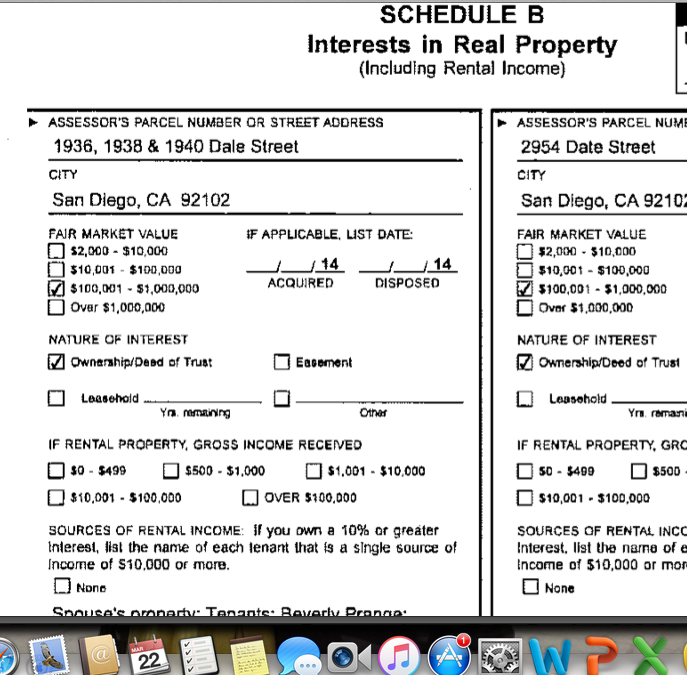 LeSar used to be an investment banker at B of A. was in charge of entire real estate profile for so Cal. 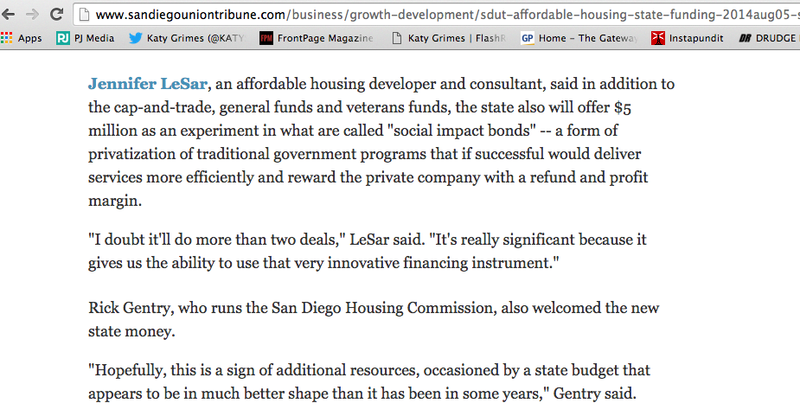 A San Diego Union Tribune story from 2015 interviewed LeSar and identified her as a “developer AND consultant”. 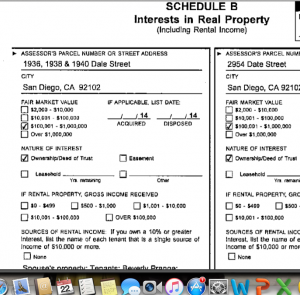 Atkins’ state-mandated financial disclosures show more than $4 million paid to LeSar’s businesses since 2010, usually from nonprofits, local government agencies and affordable housing developers. 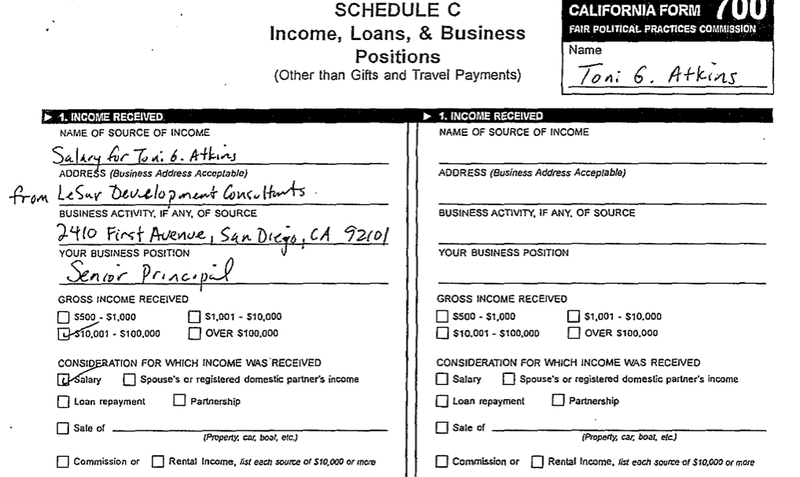 Individuals and political committees affiliated with some of the same clients — mostly those backed by developers and construction trade unions — donated almost $1 million to Atkins’ campaign coffers over the same time period. CityBeat reporter Kelly Davis said that since 2010 former redevelopment official and Jennifer LeSar, received $235,000 to provide “technical assistance” on efforts to house the homeless. CityBeat goes on to say “on Tuesday morning, the City Council extended that contract through September, upping the payment to $464,750″. (Link now removed). 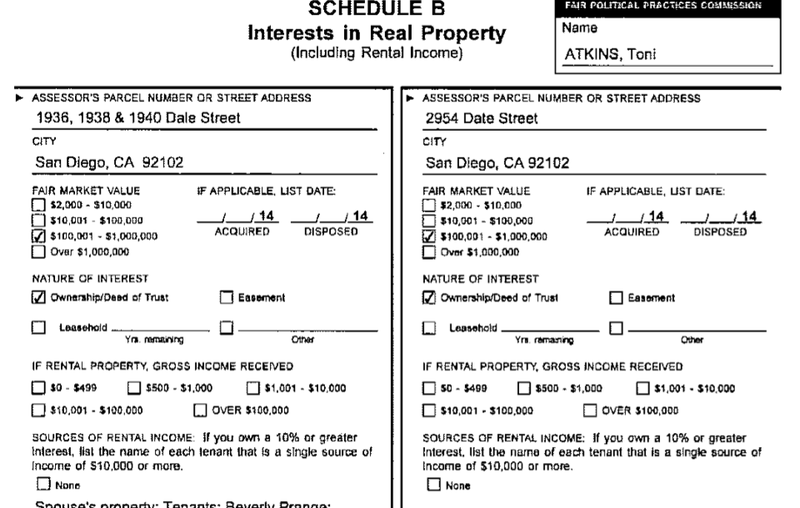 It was Atkins that declared the Federal Housing Emergency all while her partner was making money building affordable housing. Atkins takes over as Senate President following former Senate President pro Tem Kevin de Leon and his screw-ups handling his colleagues’ (and roommates’) sexual harassment, assault, groping and abuse. Most people want to know why de Leon worked so hard to cover up the sexual harassment, and if any real investigations will take place. Many lobbyists, female lawmakers and staffers been critical of the Legislature for allowing an abusive culture, where women cannot come forward to report sexual harassment or abuse without getting shunned and fired. Ironically, Democrats lost supermajorities in the Senate and Assembly when two Assemblymen and one Senator resigned over allegations of sexual harassment and abuse – including de Leon’s former roommate Sen. Tony Mendoza, who has now resigned but is suing the Senate Rules Committee. “To some extent, we bear the burden of past sins too often swept under the rug,” SCPR reported Atkins said. “We can’t change the past. But we can and we should be judged on how we shape the future.” Atkins statement means nothing at all. Every year lawmakers from across the country pass laws combatting all kinds of fraud. But what about lawmakers who knowingly blur boundaries and cross lines to enrich themselves and their families? Or the family members of powerful political figures who go into business and then curry favors with other influential politicians? Why should voters trust that Sen. Toni Atkins will be any different from Senate President pro tem predecessors Kevin de Leon, Darrell Steinberg, Don Perrata, or John Burton? This entry was posted on Friday, March 23rd, 2018 at 1:01 am and is filed under Blog Posts.